"ELF" or "E.L.F." was a sibling music project of EYE that operated for 5 years in the '00s. The sibling ELF project showcased the quirky psychedelic electronica dance music (aka. IDM/EDM) that EYE was producing at the same time as other distinct styles (eg. electro industrial, hip hop, synth punk rock). 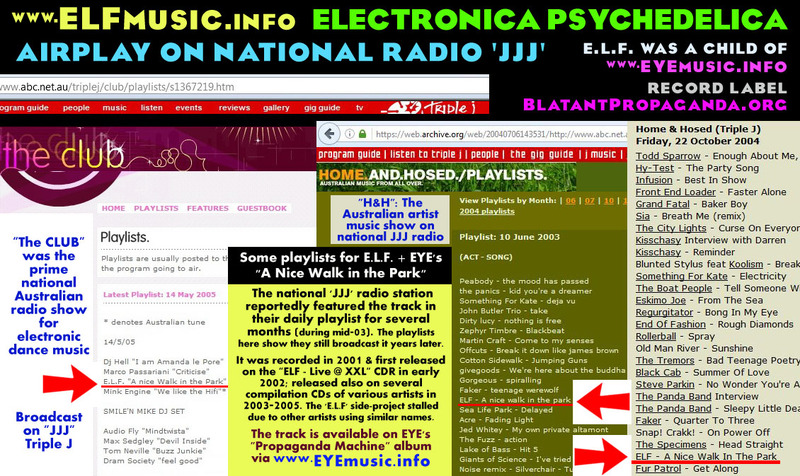 ELF's music was featured on several radio stations and national radio shows - including daily broadcast for several months on the most popular alternative music station in Australia ("JJJ")... E.L.F. 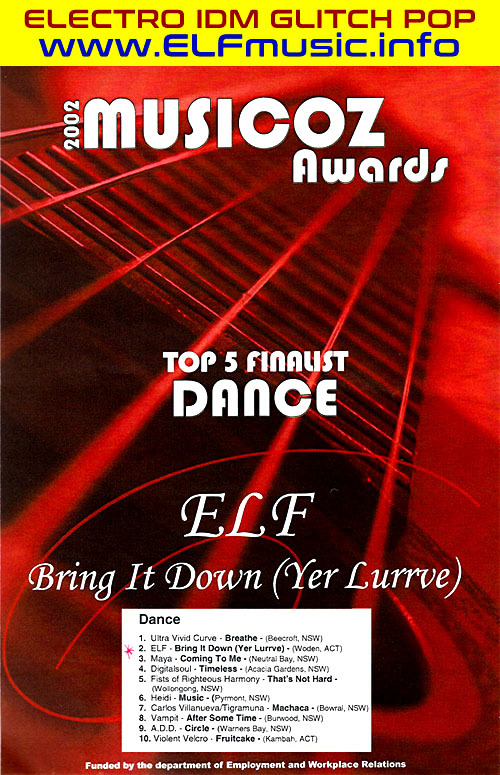 songs were on 10+ compilation CD albums (USA, Europe & Australia)... ELF performed live many times including at several esteemed festivals... Several major media publications ran features about the ELF & EYE projects... E.L.F. 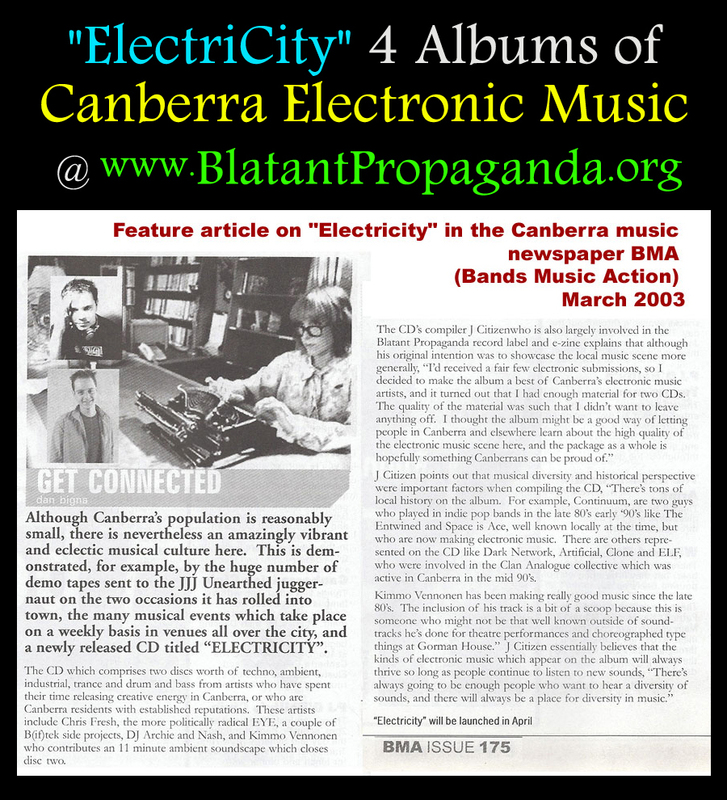 even placed 2nd in the esteemed MusicOz song competition... See further below for details. Regards the name: along with "elf" the letters denoted "Electronic Liberation Front" and "Earth Liberation Front" - the titles of several E.L.F. music pieces. 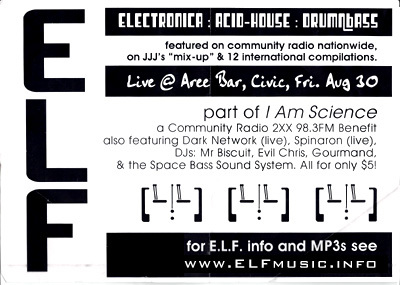 The genre styles that ELF's electronic dance music encompassed include: IDM (intelligent dance music), Acid, House, Electro Pop, Electronica, Psychedelia, Drum n Bass, Illbient, Electroclash, PsyTrance, Breakbeat & forerunners to Witch House & Glitch Hop... 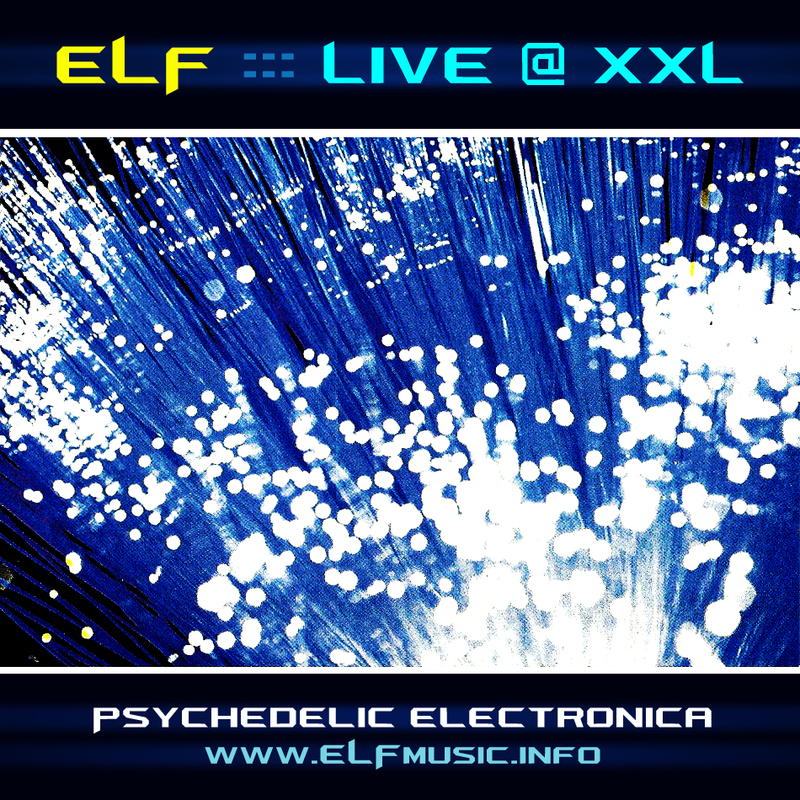 Some ELF tracks are available at this ELF Music Bandcamp page. The above is a live recording from 2002. It is also featured on EYE's youtube channel among other tracks that were regularly performed live as E.L.F. 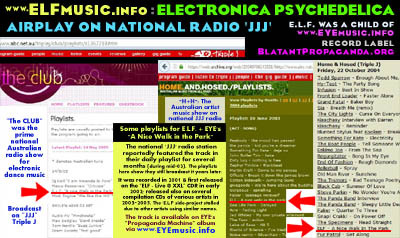 One of the most popular radio stations in Australia, Triple J (JJJ), added the ELF track "A Nice Walk in the Park" to their daily playlist; featured thusly for several months in 2003 and on specialty shows in following years (see image). 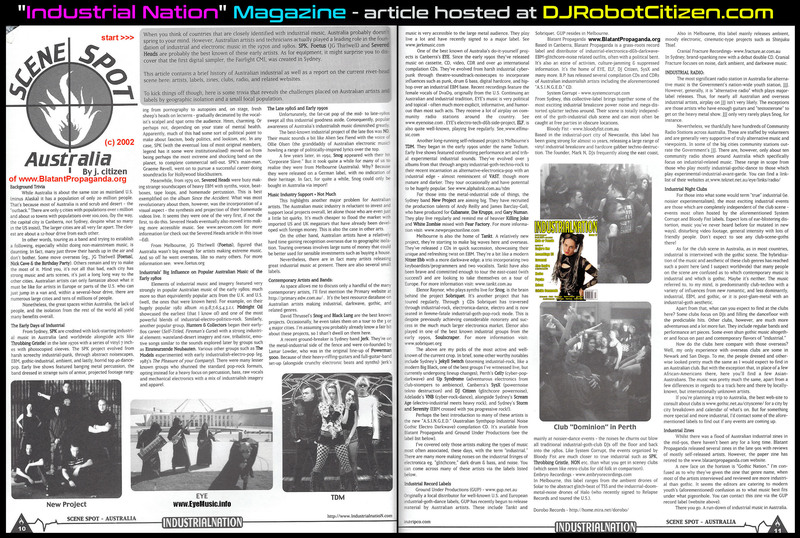 The track known as "Motivator" - later titled "Challenger" - was featured in DJ sets on the Saturday night JJJ "Mix-Up" program. "A Nice Walk in the Park" at EYE's Youtube Channel . 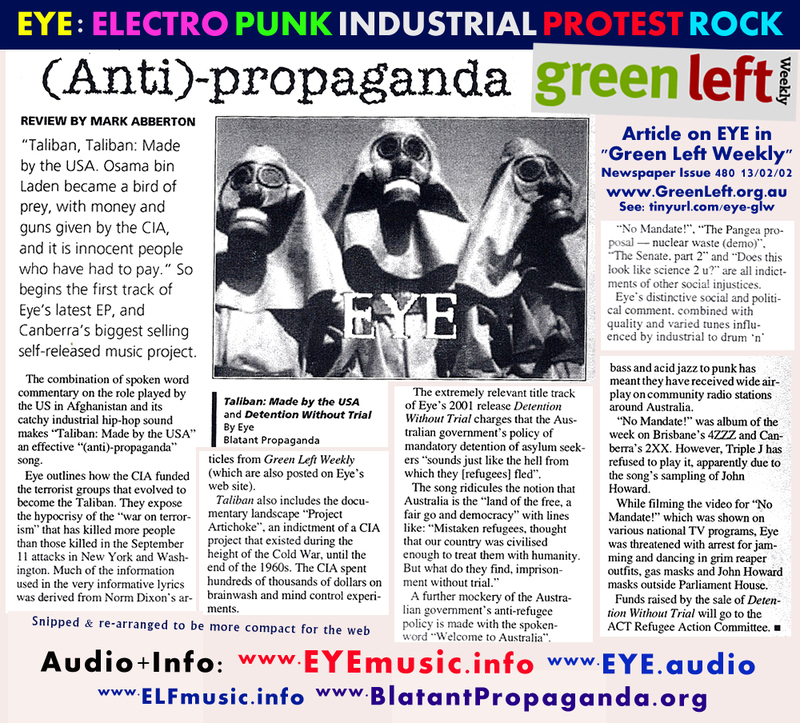 It was later included on the EYE album "Propaganda Machine". 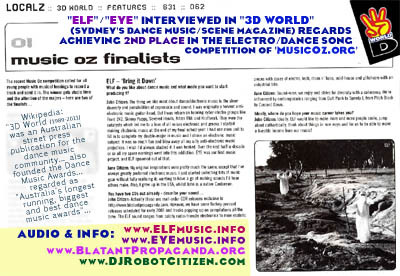 Other radio stations that broadcast songs & interviewed the members of ELF & EYE include: 2SER, 2RRR & Bondi-FM (Sydney); 3RRR, 3CR & 3PBS (Melbourne); 4ZZZ (Brisbane); 5DDD (Adelaide); 6RTR (Perth); 6CCR (Fremantle); 2XX (Canberra); 2NUR-FM (Newcastle); VOX-FM (Wollongong); the national radio shows "Beatroot" (Community Radio Satellite) & "Alchemy" (SBS). 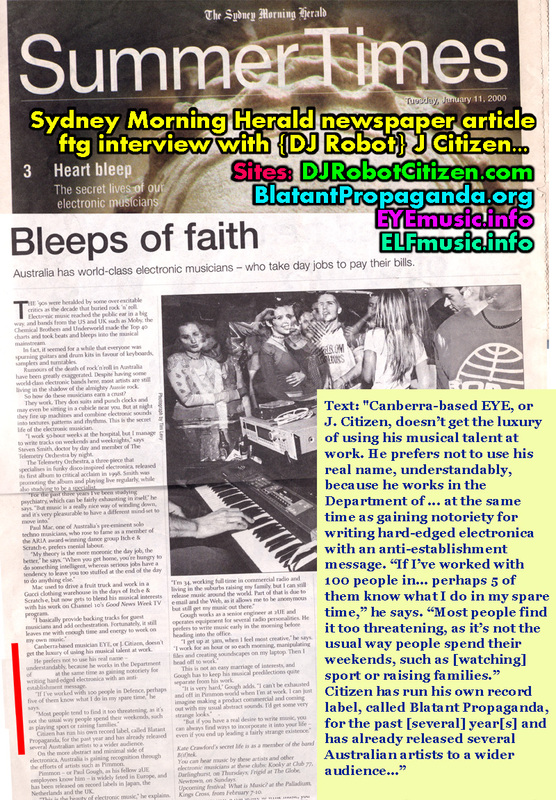 E.L.F / ELF performed at more than a dozen dance parties ("doofs", "raves" or "gigs") in several cities - Sydney, Newcastle and Canberra - and were offered slots to perform with international artists on upcoming tours and at festivals... 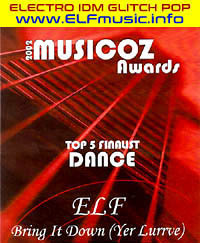 This page has a list of live performances as ELF or E.L.F. 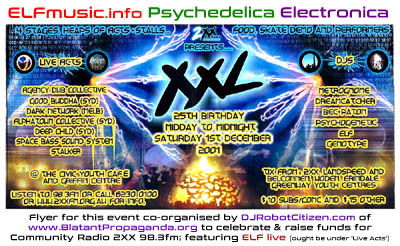 with several flyers and posters. 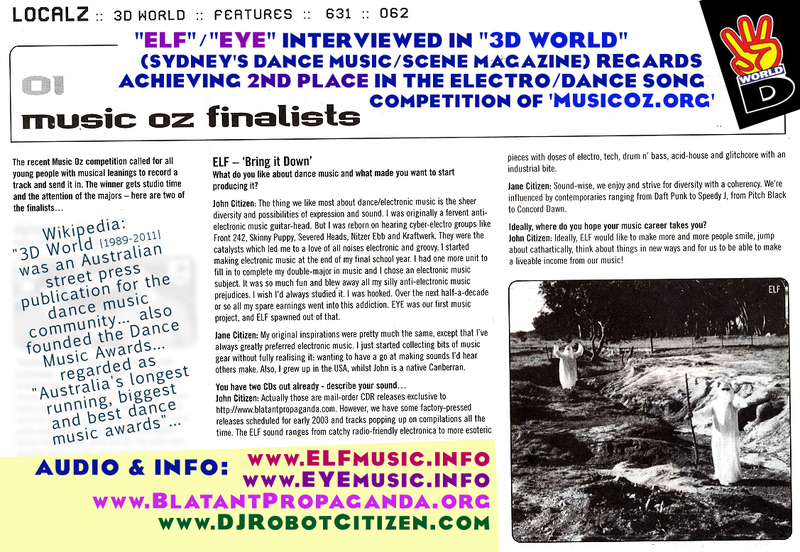 The MusicOz.org song competition awarded ELF with 2nd place in their dance music category for the electro-glitch-pop song "Bring It Down (Yer Lurrve)"
Several newspapers and music magazines have interviewed members of ELF/EYE - mostly as "J Citizen", "John Citizen" or "Jane Citizen". The links above open a new window with images of these articles. Plus reviews in many publications. 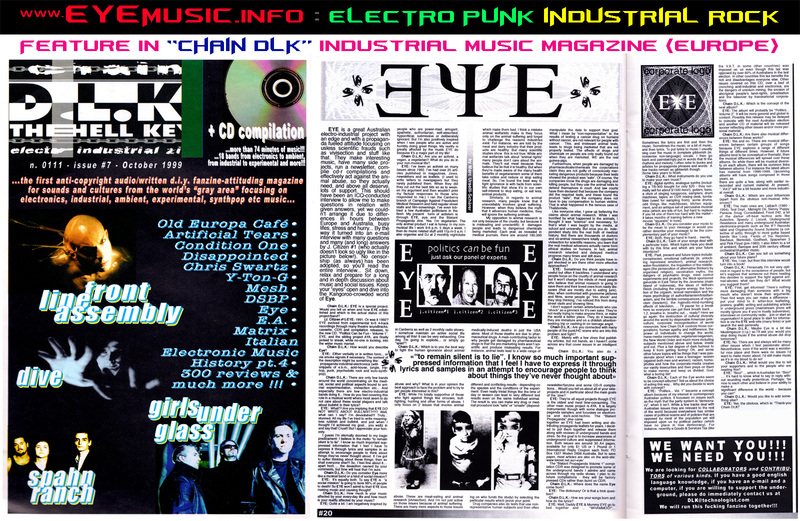 Record Labels in Europe, North America & Australia featured tunes by "ELF" (or "AYA") on around a dozen compilation CD albums, in addition to the 50+ compilations that featured tracks as EYE - for a list of collections see this EYE discography . However, despite plans for an "official" (mastered, polished and factory-pressed) E.L.F. CD Album, it was not released for several reasons explained further below. www.EYEmusic.info umbrella. 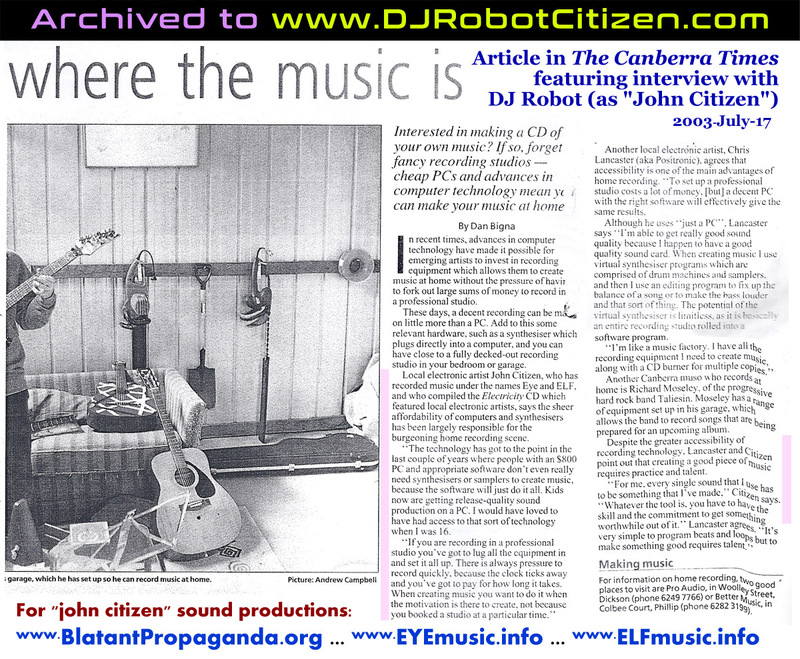 Some of these tracks can be found on EYE albums via www.EYE.audio and others are on the EYE Youtube Channel ... More are scheduled to be re-mixed, re-mastered and re-released during 2019. Some more information (image and links) will be forthcoming.